As every other breed, Poodle has its own characteristic colors. The variation here is huge, which means you can choose from plenty of colors. When you imagine the Poodle, the first thing that comes to mind is Black or white poodle, but those are just a little part of all Poodle colors. This breed’s coat can come in nearly every color that you want. 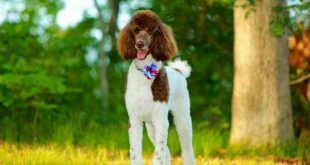 The colors the Poodle can come with are divided into two sections, as the first one you will read about is the “Solid colors” one. 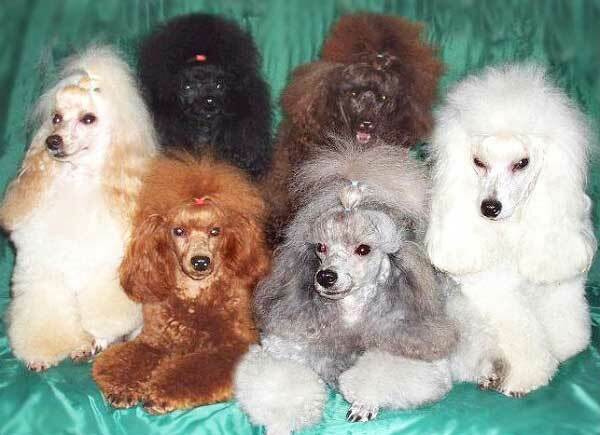 The most solid color that the Poodle is known for is the black one. 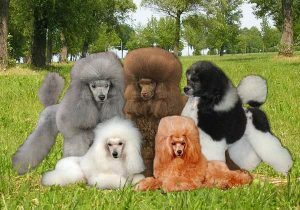 The majority of the Poodle coat colors are definitely the solid colors. Apricot and red are the newest editions, as they were recorded on the last places. They are definitely distinguishing and appealing. An interesting fact is that from an apricot colored dog, you can get a red-coated one. Many people can spot that the apricot coats are lighter and look a bit like the cream Poodle. Although, this is a pretty impressive similarity, the apricot colored Poodles can be noticed with the specific for the apricot red tint to the hair, as well as the black spots or points on their skin. There can be noticed liver points as well, but they are not accepted in the USA. Blue is associated with being a faded black. Usually the blue coated Poodles are born with black color, which starts to lighten once the puppy starts to grow. This process happens in the first year of the life of the dog in the majority of the cases, but there is a chance the process starts its development later in the life of the dog. This is one of the biggest reasons why a big part of the blue Poodles are recorded as black ones. You may notice that the outer coat of those Poodles has the same shade as black, but the roots’ color is a mixture of many colors. The age of the Poodle plays a role when it comes to the amount of each color. When the dog is in its middle age, you will notice that the medium brown is the base color. If you want to know if your Poodle is a blue coated one, you will be able to spot the dark brown eyes and black points on its body. The brown colored Poodles are well distinguished by their Cafe Au lait’s brothers, as the brown Poodles are with way darker coats. You will notice that this particular colored Poodles have dark amber eyes and liver points. There is a difference in the genes of the brown and black Poodles, as the brown carries the bb gene, not the BB one. You won’t notice any black pigments, no matter which part of the body you are looking at. This one can be mistaken with the Silver beige, as they are both shiny light tan colored. The puppy can be born in brown shade which will fade away after some time. This particular colored dogs are known for their dark amber eyes and liver points. 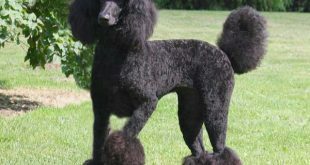 The Black Poodles are the most common ones, as the typical examples have in themselves deep ink black. The coat will be completely black, without any shades of silver or blue tinting or silver and white guard hairs. When you shave your dog’s face, the skin underneath will be deep black too, as there is no way the black to lighten if the Poodle is a true black one. The eyes will be dark brown ones, as the you will also notice the black points. These Poodles are born brown, as the silver shade will start to show on the puppy’s paws and face after 6 weeks. The whole process of getting the whole coat in silver will take around 2 years to be entirely completed. The Silver beige dog is known for its dark amber eyes and liver points. 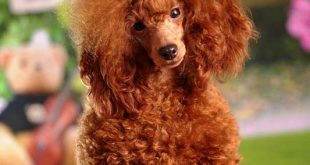 The red color is the latest edition to the Poodle’s color family, as it was registered in 1980. In Canada, a lot of breeders gathered together and founded the Apricot Red Poodle Club. The black points are specific traces of the red colored Poodles, as their liver points are not acceptable in the USA. They are originally born with black coat, which fades away till they turn 2 years. Although, the whole process needs a long time to be completed, you will notice the differences after the first 6 weeks of your puppy’s life, as its paws and face will lighten. True silver Poodles will have dark brown eyes and black points, as they carry the silver allele V gene that makes the color of the coat a diluted gray. The white color is another very popular one, as the true white Poodles will have pure, snow looking coat. Be careful with the breeders, as some of them mix white tinted with apricot or beige dogs and sell them as white ones. 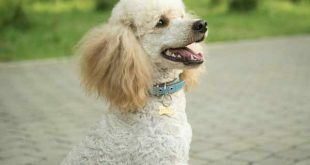 It is normal for a white Poodle to have black spotting here and there, but be aware of in any kind of ticking in the white. The coat will appear as dirty, if the puppy has in it ticking gene. It is not acceptable for the white type of Poodles. The gray color can be developed in white poodles, which will keep this type of coat. There is chance of black Poodle to get gray hairs when it gets in its middle age. The cream colored Poodles should have black spots. If it is hard for you to make a difference between Cream, Cafe au Lait or Silver Beige, you should check out the nose, as this is the part that distinguishes the whole dog. The nose should be black, as the Cream coated Poodles have the Cch gene in them, which makes the coat appear as cream colored. In most of the cases, the Poodles have more than one color in their coat. As the Poodle is very old breed and went through a lot, nothing can beat the multicolor. A lot of breeders in the past tried to get rid of it, as their goal was to get only solid color. But definitely, the real beauty is hiding behind the multicolor. Just because the Poodle has multiple colors on its coat, it definitely doesn’t mean that it was bred to become a mixed dog. The most common coats are the following ones. The Parti Poodles are known for being the most well-known multicolored representatives from this breed. Parti actually means “Particularly’ colored, as their coats are covered with large irregular patches that can be different colors placed on white based color. There are many Poodles like Brindle Partis or the Sable Parti’s that are known for being Parti poodles. The Phantom Coated Poodles have a base color, which is defined by another one. The coat’s color scheme looks a lot like breeds such as Doberman or Rottweiler. This particular type can have different colored coats, as the most popular ones are a black phantom with tan points, a Chocolate phantom with Cream points, as well as the Silver Phantom with White points. Tuxedo is another color ‘schemed’ type, as it has something to do with the Parti Poodle Coloring. On the dog’s back, you can notice ‘blanket’ or ‘saddle’ of colors, which a specific part of the Tuxedo Parti Poodle. There are white spots that can be found on the dog’s throat that go all the way till the neck, as well as the underside of the tail, the chest, as the inside of and up the outside of the legs. The colors here may vary. Ticking looks a lot like a mark, as you can have a dog with base color that has ticking on its coat. Ticking can be found all around the dog’s body, as it looks a lot like the Spaniel dogs. Sable coloring is often associated with the ‘Shepherd Family’, as it is again very well-known color. A lot of people say that this type looks very much like a ’burnt toast color’, as it is a combination between brown and black tipping. Another interesting fact is that many people found this color scheme to be one of the most drastic ones, because after only 6 months, the puppy looks completely different. The ears will remain its original color after the dog enters adulthood. Brindle is a type of pattern that develops not only in Poodles, but in breed such as Brindle, Boxers and Danes. The colors may vary, but what makes this coloring magnificent is the tiger striped coat. One very important thing that you should know about the solid coloring is that it may change, as the fading is not something to worry about. Some of the dogs are born with this color and will remain with it, as others will change in later in their life. “Clearing” is the process of transitioning the color, as it can fade or lightens. The lightening can develop only on certain places on the coat, and not on the whole coat. It often does not affect the ears the thicker guard hairs. Poodles from the Cafe Au lait type change their coat from black to cafe till the second year of their life. The same statement goes for the Blue, Apricot and Silver Poodles, as they are all born with black coat that starts to fade and the real color shows up by their second year. It is normal for the owners to be surprised when their dog’s coat color starts to change, but this process is completely normal, as there is nothing you should worry about. One good example can become the Blue Poodle that is born with black fur, as a lot of people think that its coat is black, and not blue. There is chance for your puppy to get other colors on its coat, if its parents have the Parti genes in them. The blue color will pop up, but there is no guarantee that there won’t be other colors as well. It is not strange if your Poodle starts to get its coat dull, making it look yellow or brassy when the dog starts to get in its adulthood. This can be in result of the environment, and other external factors, besides the aging, which is completely natural and irreversible process. As the human hair, the Poodle one goes through 3 stages- Growth, rest or release. The hair will never end, as if one hair falls, other will grow. There is chance that you don’t notice the change in the beginning, but after some time, you will definitely start to get an idea of how the shine, depth and richness of the coat has changed. The results can sometimes be very dramatic and drastic. Those changes can easily be handled if you are using the right products and treat the color of your dog. Color enhancing shampoos are a great way to preserve the richness and shine, as the shampoo is made for canines. If you are not sure how human shampoo will affect your dog’s fur, those shampoos will guarantee for amazing results. You should not use human shampoo when bathing your dog. No matter how good, organic or expensive your human shampoo is. Just get a dog shampoo to be on the safe side. Human shampoos have different Ph levels and in some cases they can cause different health issues to your dog. There are many brands that offer variety of products that will keep your furry friend’s coat nice and shiny. This process is called ‘Progressive Graying’, or the G locus and it develops if your dog has a mutation in its gene that answers for the color. This usually happens if your Poodle is a Blue, Black or Brown type. Once the Poodle starts to grow, the fur will start to fade. This does not state that every dog from this type will develop the case. The chance is 50%, as the mutation is a dominant type, and one of the parents have it. It is very relative, but you should be prepared for this. If the dog got the same gene, you will notice the difference in its fur after the third month till it enters the adulthood. It can develop later in life as well, but the chances are very small. The chance of seeing changes in the skin tone are also real. One of the factors is the sun that touches the skin, as it often affects the belly. If you notice that your dog gets darker spots on its pink belly, you should not panic.